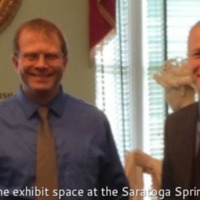 In April 2015, to celebrate Saratoga Springs' centenial as a city, the Saratoga Springs History Museum (SSHM) opened an exhibition that tells the story of the city of Saratoga Springs through historical maps. This exhibition is the fruit of two years of colloaboration between Skidmore College's History Department, John B. Moore Documentary Studies Collaborative, and Tang Teaching Museum with the Saratoga Springs History Museum, Saratoga Springs Public Library (Saratoga Room), City Historian and County Historian. This page tells the story of that collaboration from its first steps to its development as a class project, and thanks the many Saratogians and Skidmore community members (and beyond) who helped bring it together. A curatorial committee led by Teri Blasko (SSPL), Jordana Dym (Skidmore/History), Mary-Ann Fitzgerald (UWW alumna and City Historian), Jamie Parillo (SSHM) and Rachel Seligman (Skidmore/Tang) identified maps and supplementary materials at their institutions, in the Saratoga County archives, Duke University's Rubenstein Library, the Library of Congress and even France's National Library, and brainstormed exhibit goals. In summer 2014, Deirdre Schirff (IA/SP, '15) and Allie Smith (HI/SP, '15) joined the team with a 5-week summer collaborative research grant. They worked with Profesor Dym and the committee to select and catalog materials under consideration. Zach Mooring, '16, a student in Duke University's Art, Art History & Visual Studies program also worked with the team under the supervision of Prof. Mark Olson. 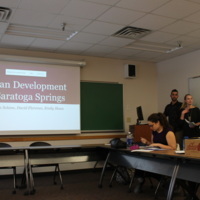 In Fall 2014, an upper division history class, Mapping the Americas, worked with the selected materials, undertook additional research, learned the history of Saratoga Springs and prepared the story that the exhibit will tell. 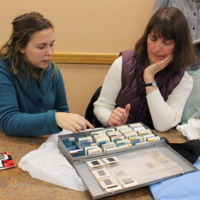 Twelve students learned about the history of cartography, and began thinking about how to use Saratoga Springs maps to tell about its history, creating a pilot exhibit in Tisch Learning Center, as Emily Sloan & Elana Scaglia discuss. 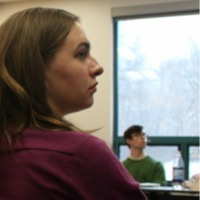 Mapping Saratoga from Skidmore College on Vimeo. 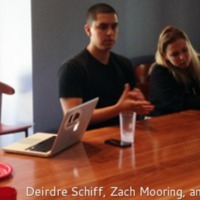 In Spring 2015, Eiko Franklin, Erik Morrison, Giulia Morrone, Elana Scaglia, Deirdre Schiff, Emily Sloan and Allie Smith worked to refine text for the exhibit with Dym and the exhibit committee, and worked up additional promotional materials, including brochures, and educational materials. Giulia georeferenced over a dozen exhibit maps and created a video show for the exhibit. An expanded exhibit advisory committee, including Bob Jones (Skidmore, Economics/GIS), Alex Chaucer (Skidmore, GIS), and Lauren Roberts ('04, American Studies, County Historian). Art, Art History & Visual Studies Prof. Mark Olson of Duke University led workshops in June 2014 on Omeka, the platform that houses the project's digital map archive and that will present the exhibition materials. 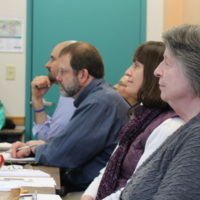 Beth Dupont of Skidmore's Academic Technologies office hosted Mark and in spring 2015 worked with Monte Evans (Warpwire Technologies), who supported the Cafè Lena History Project Omeka site, to discuss best practices for the college. Adam Fisher-Cox tweaked the Berlin style for better functionality. Martin Brückner, U. Delaware, visited camups and the SSHM on October 8/9. Brückner's exhibition at the Winterthur Museum, Common Destinations (2013-14) about maps in the early U.S. republic was both model and inspiration. Brückner led a lively and wide-ranging discussion of working with maps to build a story in exhibition format that helped students think about how public work differs in form and content from traditional academic writing. 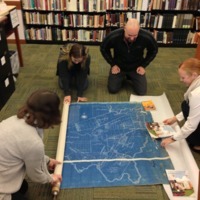 Independent scholar Field Horne shared knowledge about early maps and materials from his edited book manuscript on the history of Saratoga Springs, due out in 2015, pointing the group to an 1829 manuscript map, among other archival treasures. Trusting the class with unpublished material was an act of generosity that helped everyone get up to speed quickly. This book will be a terrific resource for future scholars and projects. County supervisor Matt Veitch inspired the class on November 24 with a presentation of his research in urban development. Using photographs, maps and a lot of archival research to describe how downtown and its surrounding neighborhoods changed from 1961-1986, answering questions and providing a lot of connections. Local individuals and institutions generous loaned their materials to make this exhibit come alive with original or unique copies of maps, notably the Saratoga Springs Public Library, Office of the City Historian, Saratoga County Archives, Scribner Library (Skidmore College) Special Collections, the Yaddo Corporation, Donald Carpenter, and Harvey and Cassie Fox. Michael Levinson added depth and dimension to the exhibition by layering evocative period objects--from Regency-style clothing and remnants of an earlier Congress Park fence to bottles of spring water and a bicycle. The Alfred Z. Solomon Charitable Trust and JIMAPCO, provided the financial support to hang the show. 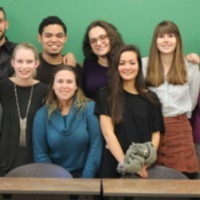 Additional support was provided by Student-Faculty Summer Collaborative Research funds and the John B. Moore Documentary Studies Collaborative, Skidmore College.